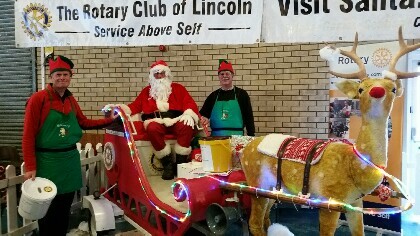 The Rotary Club of Lincoln Santa Sleigh, constructed & maintained by Peter Manton, helped to provide a festive atmosphere at the Lincolnshire Food & Gift Fayre to the delight of the many children present. £287 raised for local children's charities including St Andrews Hospice. Santa & Rotary Elves on duty.